1 of 3 Heat oven to 400 degrees . In a large skillet, heat 2 tsp of the olive oil over medium heat. Stir in 1/2 cup of the onion and the apple; cook 5 minutes. Stir in 1/2 bag of the spinach. Cook 2 minutes, stirring, until wilted. Transfer mixture to a bowl; cool slightly. Shred chicken and stir into filling, along with cheddar, 1/4 plus 1/8 tsp of the salt and 1/8 tsp of the pepper. 2 of 3 Fill each wrapper with 2 tbsp of the filling. Fold into halfmoons and seal open ends with a fork. Place on a baking sheet and brush tops of empanadas with egg. Bake at 400 degrees for 20 minutes, until golden-brown. 3 of 3 Meanwhile, in same skillet, add remaining 2 tsp oil over medium heat. Stir in remaining 1/2 cup onion and the frozen corn. Cook 5 minutes, until onion is soft and corn is heated through. Stir in garlic; cook 1 minute. Mix in remaining 1/2 bag spinach until wilted, about 2 minutes. Stir in lemon juice, remaining 1/4 tsp salt and remaining 1/8 tsp pepper. 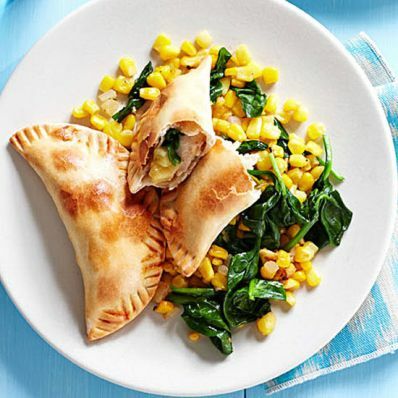 Serve empanadas with warm corn salad. Per Serving: 722 mg sodium, 24 g pro., 5 g fiber, 72 g carb., 7 g sat. fat, 66 mg chol., 18 g Fat, total, 521 kcal cal.